When the glory of their racing days are over, not every thoroughbred gets to retire to greener pastures. Some horses are neglected and abused, making them frightened, aggressive, and untrusting animals. These former kings of the racetrack need a caring hand to nurse them back to health. At Wateree River Correctional Institute in South Carolina, they’re receiving that care, and in the process, helping inmates heal from their own troubled pasts. Those working in the Wateree horse program receive intensive vocational training in every aspect of horse and barn care and management. Wateree has graduated close to 30 inmates since the start of the program in 2005. The facility’s barn, which was built by inmates in 2004, is currently home to 32 horses. The animals come to Wateree through the Thoroughbred Retirement Foundation (TRF), a non-profit organization that provides dignified, lifetime retirement for thoroughbreds. Many racehorses are not humanely dealt with once their owners no longer need them. They can even be killed at a young age for their meat. TRF has rescued hundreds of horses after their racing days have ended. “The program is designed not only for the horse to get a second chance, but for the inmate to get a second chance,” adds Anderson. The TRF partnership with correctional facilities began in 1984 at Wallkill State Correctional Facility in New York. In exchange for land use and labor, TRF designs and implements the vocational training program in equine training and management. Today, it has about 450 horses in seven correctional facilities across the U.S. The bond Anderson notices is part of an entire area of scientific research called equine assisted psychotherapy. The practice involves teaching people to work with horses in a way that will encourage emotional growth and learning. 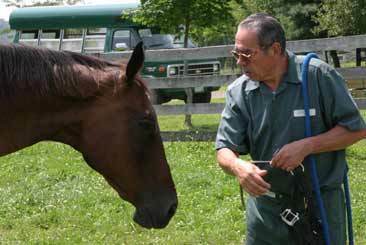 The program helps the horses as well, who often suffer from devastating injuries at the time of their retirement. “They’re only two or three years old, and after so much racing, their long, spindly legs now have torn ligaments and shattered bones. 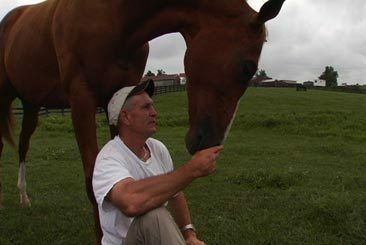 So the inmates really have to nurse them back to health and retrain them,” says Sheri Bylander, who is making a documentary, due out in 2008, about TRF’s work in correctional facilities. While filming, Bylander was also struck by the unusual similarity and bond the inmates and horses share. Not only do the inmates form a life changing relationship, but also they learn marketable skills they can use after release. Of course, such specialized offender programming comes at a cost. For Anderson, it’s been a price worth paying. These programs are continuing to grow, with states like Tennessee and Georgia considering similar ones. For Wateree and all the other correctional facilities that may serve as the new home of a retired racing horse, the program remains a meaningful way to help both inmates and horses get their lives back on track.